Found one file extension association related to Desktop Sidebar and 1 file format developed specifically for use with Desktop Sidebar. Developer / company: Idea2 s.c. Desktop Sidebar provides you with instant access to the information you most desire by grabbing data from your PC and the internet. The result is a dynamic visual display you configure and control. How can you make this possible? Choose from among a wide selection of information conduits (e.g. 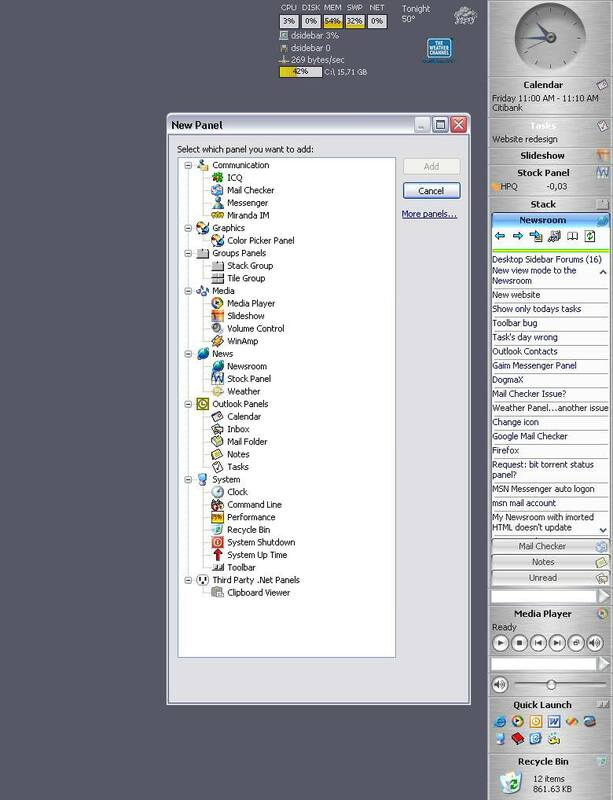 MS Outlook, toolbars, newsfeeds), called "panels". Fully customizable, Desktop Sidebar allows you to dock these panels to the edge of the screen, or arrange them anywhere on your desktop as you wish. All panels are configurable with a number of specific options. With hundreds of skins available in our Extras Page and an easy to use Skin Editor, you can freely change the appearance of Desktop Sidebar to suit your tastes. Seems like old and no longer available software. The Desktop Sidebar software seems to be old or discontinued. If you need more information please contact the developers of Desktop Sidebar (Idea2 s.c.), or check out their product website.